If you live in the country, you may already know about keeping a woodpile stocked. But even many city neighbourhoods are more like forest villages than concrete jungles. These places, too, are great sources of economical, carbon-neutral home heating fuel. 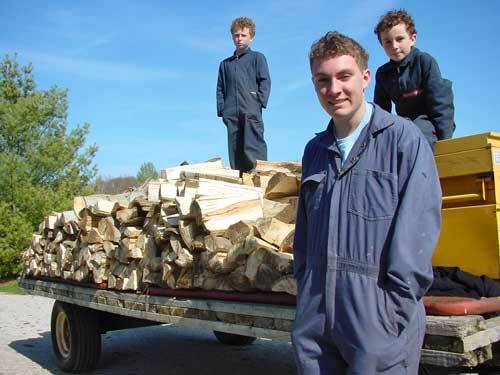 And preparing that wood is also a great way to introduce kids to the value of productive outdoor work. Wherever trees die, break off in the wind, or outgrow their allotted space, you’ll find the potential for firewood. I say potential, because having trees (or friendly neighbours that do) is just the first and easiest part of the operation. Making that wood conveniently and effectively burnable in a wood stove or fireplace comes next. Sounds like work, and that’s because it is. But as usual, there are two ways to look at the job: It’s either drudgery you should avoid by stocking up on artificial wax fire logs, or a fitness regime that also warms your house. When it comes to making firewood, I see the glass as half full. That’s why I’m happy to share what I’ve learned over 20+ years of heating my house with wood and elbow grease. There’s nothing like the security of a well-stacked wood pile. The challenging part of making firewood is the splitting — cleaving sawn logs along the grain lengthwise. Why bother? Most logs are too big to fit comfortably in a wood stove or fireplace, and splitting is the best way to make them thinner. And even if they aren’t too big, split wood burns better because it dries more thoroughly without a continuous wrapper of bark. technology. Yes, there are hydraulic log splitters out there to ease the burden, but they’re costly and loud. Unless you’ve got a mountain of knotty wood to split, a good axe is quicker, quieter and better for your health. The correct splitting axe is key though, and its attributes may surprise you. The splitting axe is the quintessential blunt instrument, one for which there’s no substitute. 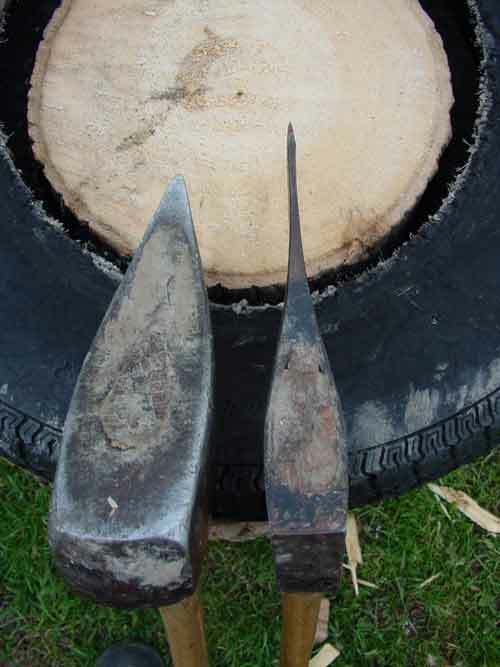 Don’t even try to split firewood using a regular axe with its too-thin profile. Splitting axes don’t have to be sharp, but they do need to be heavy (6 lbs. to 8 lbs.) and bluntly angled in cross-section. This angle is what drives the log apart and stops the axe from sticking in the wood uselessly. The axe you see here on the left is wonderful. It’s been with me for 25 years and we’ve split hundreds of cords of wood together. But there’s another problem with splitting firewood, a hitch that the best splitting axe won’t cure. How do you hold up the wood on it’s end before hitting it? All the firewood I make goes through the car tire arrangement you see here. 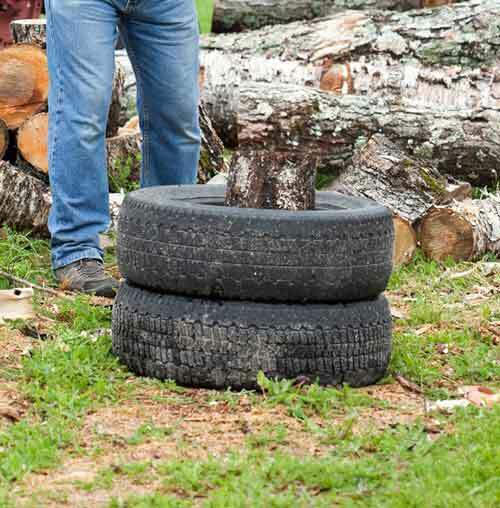 The tires are bolted together through the sidewalls in three places, forming the ideal holder for all but the largest logs. Just drop the wood in on-end, and bang-away with your axe as many times as needed. You never have to bend down and stand another log up before hitting it again because nothing falls over. 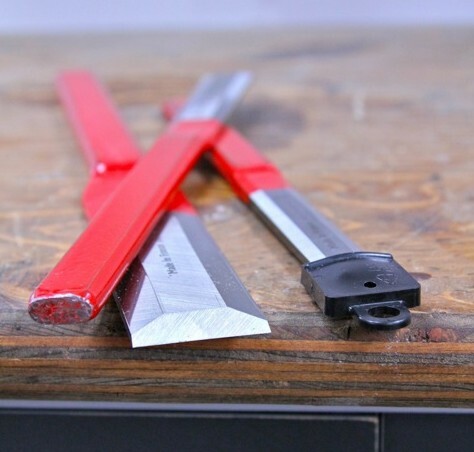 Another bonus is the way the sidewalls act as a cushion for the ax handle, keeping the blade from hitting the ground, without need for a chopping block. Got a loose axe handle? Try Chair Doctor (Lee Valley Tools 800-267-8767). It’s a thin viscosity adhesive that wicks into the end of the handle, swelling the wood and locking it within the axe head.